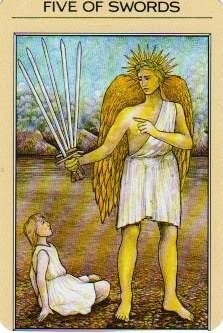 Apple River Tarot Readings - It's Not The Destination, It's The Journey: Five of Swords - Dude, Don't Be Tellin' Me What To Do! Five of Swords - Dude, Don't Be Tellin' Me What To Do! As much as I do greatly appreciate the historical and cultural value of my Mythic Tarot deck, some of these Greek gods not only have attitudes, they can bring out the attitude in me, knowing I have 'issues' with authority. Many of these Greek gods remind me of what John Bradshaw would call 'undisciplined disciplinarians. I think most of us have had experiences with these authority types, especially in school. I love being my own boss, as an artist, and a Tarot reader, as it gives me freedom, to have the option to choose. You may have a certain amount of freedom working for someone else, but generally you do what you are told, or you risk getting the old sack-eroo, the heave-ho, the boot! YOU'RE FIRED! It is easy for many of us to feel intimidated by, or maybe resentful toward authority. We can either respond, react passively or aggressively. Many of us grow up in families were we don't learn how to resolve conflict. The fight or flight reaction is often the usual behaviour pattern we are accustom too. Assertiveness is not in our vocabulary, and we don't really know what it means. Either we are afraid to stand up for ourselves, or we might become verbally aggressive or abusive, even lash out with fisticuffs, as my father use to call it. He was good at fisticuffs! Here we see Orestes, his body language is in a physical position of powerlessness, small and seated on the ground. He is being told in no uncertain terms by the towering Apollo, that he is obligated to avenge his father's death. Orestes dreads what he must do, though every part of his being wishes he could change his fate. The balance of power is not balanced at all in Orestes's favour. Obligation has no redeeming qualities in my opinion. Choice rarely if ever, comes into the equation. It means we do things because we are being forced in one way or another. Having the will and want to do something is an entirely different situation. The old proverb or adage 'you catch more flies with honey than vinegar' comes to mind. I always used to get my underwear in a big knot when I'd hear the word obedience, because I equated it with obligation. There was always going to be someone telling me, trying to guilt me into what I should or shouldn't do. Obedience had nothing to do with wanting to, or the willingness to, behave a certain way. Today, understanding, and knowing the distinction between these two words, has made all the difference, enabling me to strengthen my relationship with the God of my understanding, who is not the merciless authority and the balance of power has been shifted. It has allowed me to better accept, and to understand my own limitations and capacities. I've been raised to behave and to to please my parents. Often through manipulation. Feeling guilty when not living up to their expectation was something very common. Like you I have learned to be assertive and speak my mind but old ways are hard to forget. Guilt that's a big one for me too Ellen. For sure it is hard to shake old habits, they are like a reflex. I really have to slow myself down and think about how I am going to handle situations, and people that bring on feelings of fight or flight.